Medium and Large Gumbos are served with a choice of dinner salad or potato salad. There may be a risk associated with consuming raw shellfish as in the case of raw protein products. If you suffer from chronic illness of the liver, stomach, or blood or have other immune disorders, you should eat these products fully cooked. Special varieties available to go. We now offer catering to go for your dining convenience. 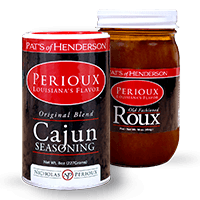 Take a Little Louisiana Flavor Home Tonight! See Our Display in the Lobby or Ask Your Server for Details.